Leading Automotive Interior Trim and Seating manufacturing companies continue to use SCHWABE Die Vacuum Cutting Systems for high volume parts production. The SCHWABE Press with Vacuum Cutting System is favored over automated / digital cutting systems for the die cutting accuracy and close tolerance. How does the Die Vacuum System work? Up to 40cm (10″) of tri-laminate material is positioned on top of the steel rule die. The hood then encloses the die and material within the carrier, the cutting matrix being mounted in the hood. A vacuum pump then expels the air from the system which draws the hood down and compresses the material to approximately 5cm (2″) in height. 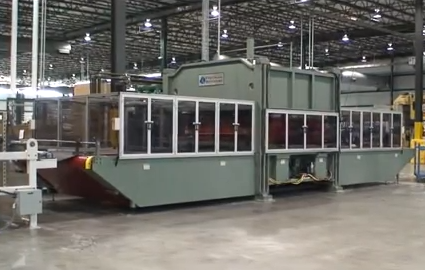 The entire system is then incrementally fed through the SCHWABE hydraulic cutting press . When the vacuum is turned off, the lay recovers to its original height and the hood is automatically lifted clear. The components are then removed and the cycle can be repeated with a new lay of material. 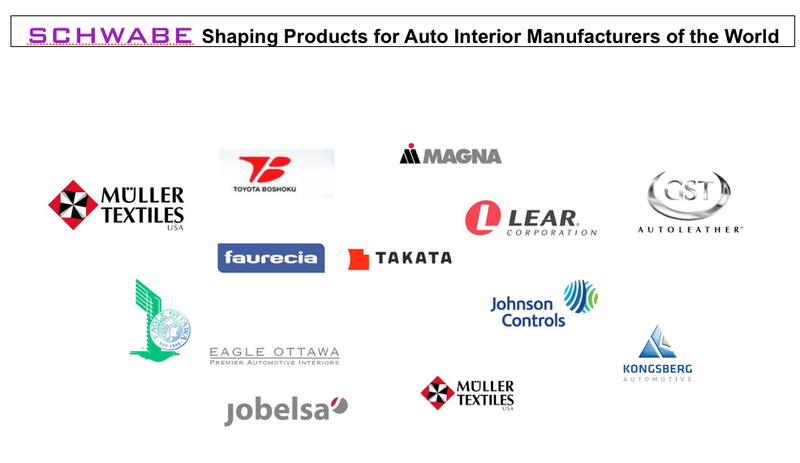 The auto interior industry continues to use the traditional cut-and-sew and trim processes. 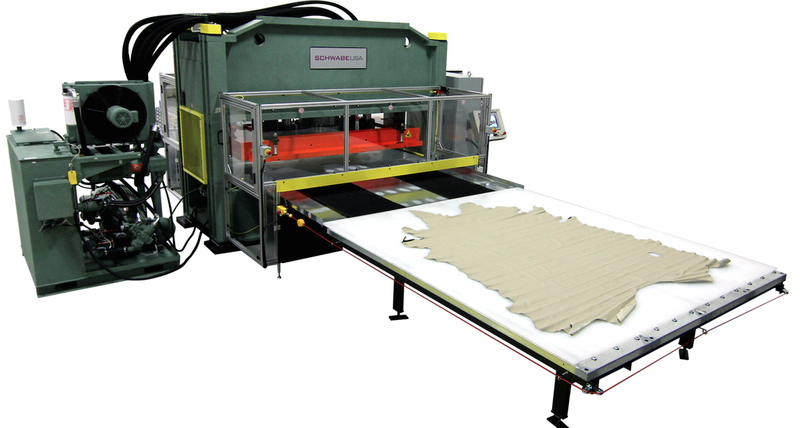 The die cutting process uses nesting to optimize the fabric-cutting efficiency and minimize the waste. 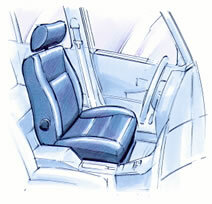 Once the die cutting press cuts the different shapes of material (leather or non-leather fabric) the pieces the material fabrics are sewn together to make the seat covers. 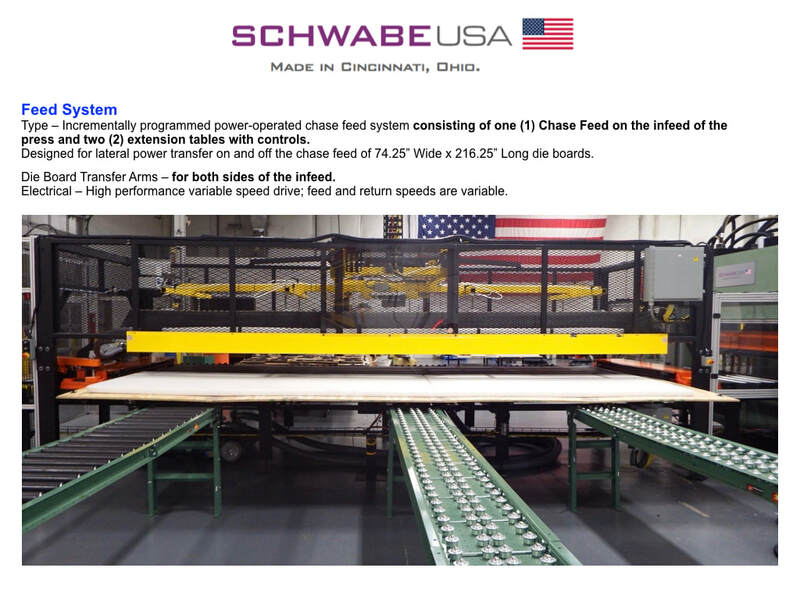 SCHWABE Sraight Ram Beam Press with Dievac System - High volume manufacture of automotive interior trim components is achieved with great precision and excellent material efficiency using Ontario Die International's Dievac system on a SCHWABE progressive feed beam press. 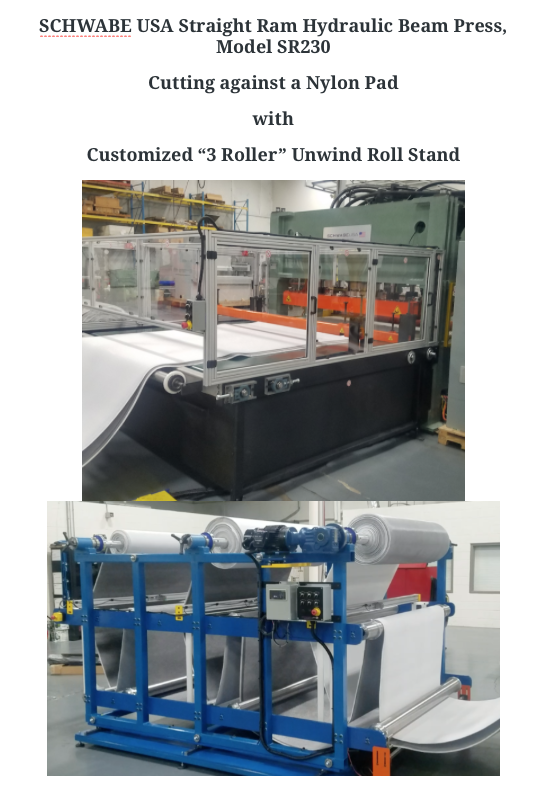 This system of diecutting is used for cutting both rolled and sheeted laminated fabrics and vinyl in multiple layers in widths up to 2m wide. Inverted steel rule dies, cutting upwards, are designed and built by Ontario Die International. These precision cutting dies are built to close tolerances for accurately cut parts, with premium steel and dieboard for long life, and our designed to be maintenance free. 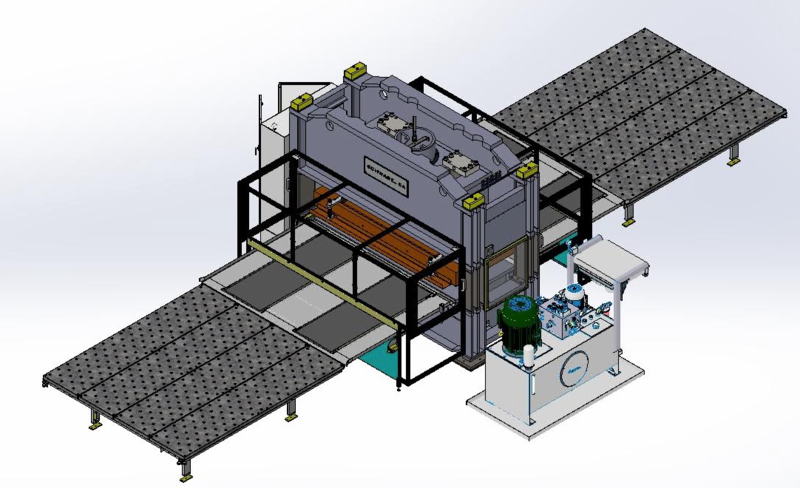 ODI's exclusive Dievac system uses vacuum to precompress laminated materials prior to cutting on SCHWABE Beam Press therefore eliminating material movement and insuring accurately cut parts. Excellent material efficiency is achieved through tight nest spacing thereby reducing scrap material. 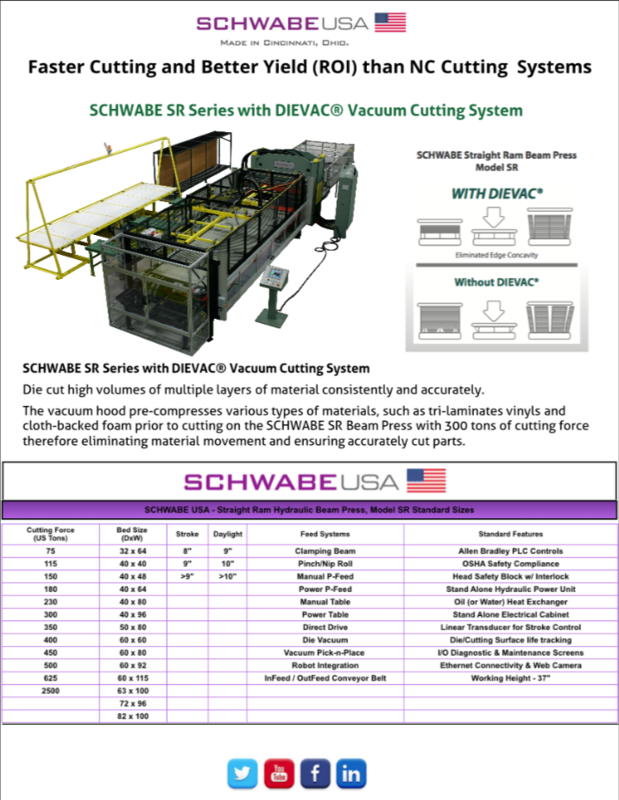 SCHWABE USA Straight Ram Beam Press with Die Vac vacuum cutting systems for high volume cutting automotive parts components. Used with a large die board with hand placed tools for cutting a single ply of material or multiple layers of material. Index feed accuracy up to 1/32" for precise cutting. 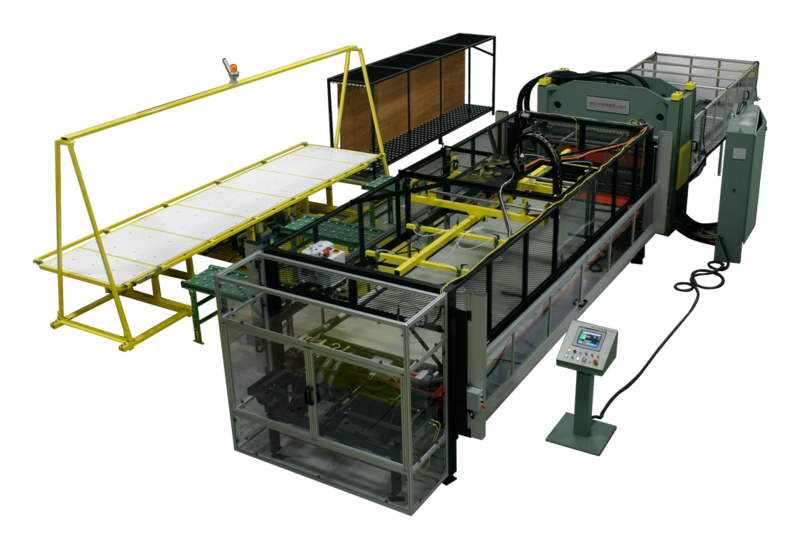 Press can feed die boards and material from both sides of the press increasing throughput and productivity. Over 20 die boards with material can be cycled through the press per hour. The tool could also be head mounted and the press operates as an automatic progressive feed press, again with extremely tight index tolerances can be achievable. 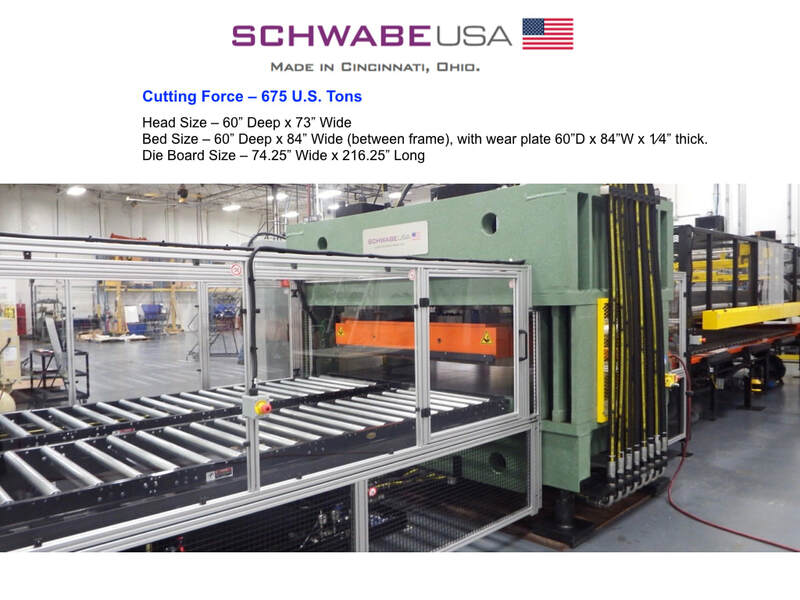 ​Tonnages available begin at 150 tons up to 600 tons of cutting force; whatever is required for your material can be designed and built by Schwabe. Die Cutting is recognized as the most efficient method for precision cutting of spacer fabric material. 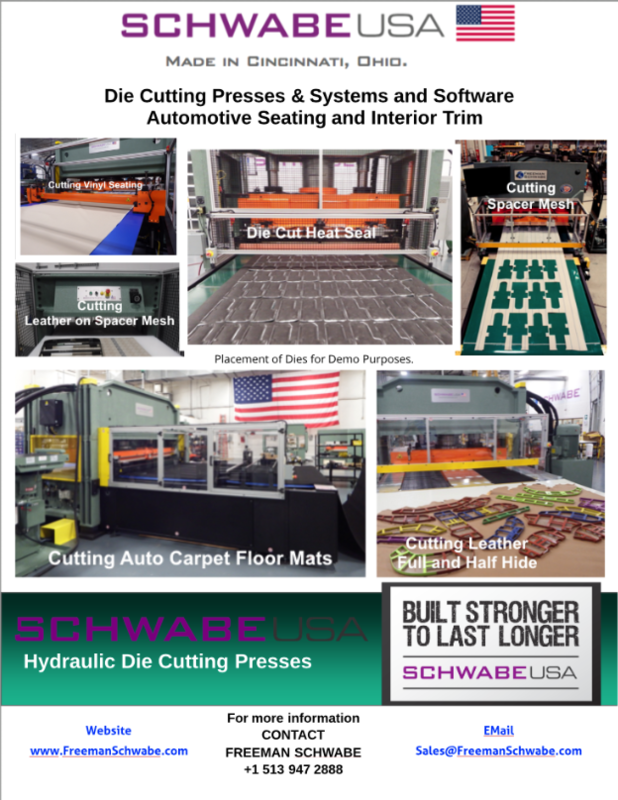 SCHWABE USA is the leading supplier of Die Cutting Systems for cutting Spacer Mesh Fabric. Check out more details on SCHWABE SR 230 Cutting Press Machine, die cutting Spacer Mesh on a nylon belt. 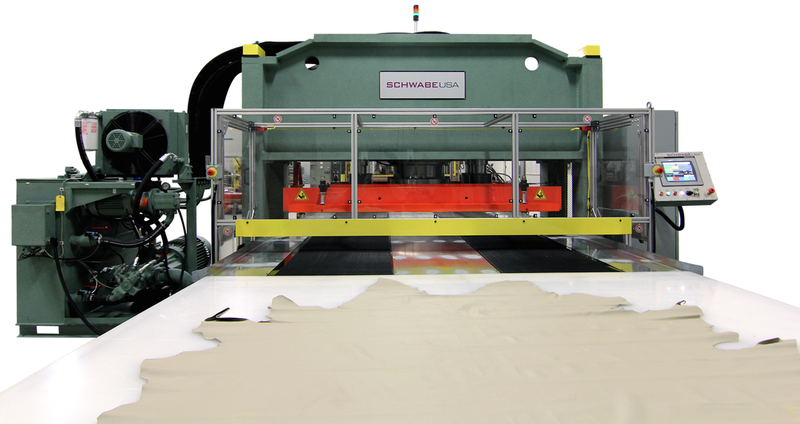 Schwabe Press SR350 cutting auto interior carpets on a urethane cutting belt in out clamp feed. 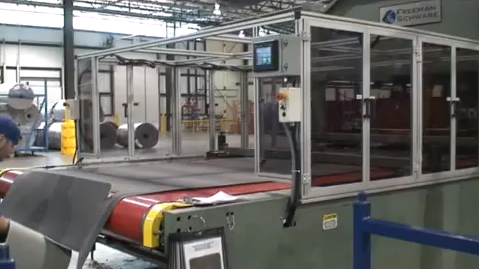 Able to handle full hides with automatic infeed & outfeed continuous belt conveyors. Able to handle die boards up to 98" wide x 108" long (2.5m x 2.7m). Simple ease of loading & unloading of dieboards for more per hour production. Press design eliminates die jumping which reduces die damage. Standard accessories are anti kick-up devices for dies and infeed sensors & receivers. There is an increasing global demand for automotive airbags as new car designs include front, side, and curtain airbag assemblies. 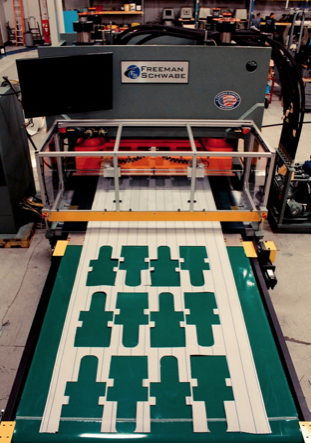 Freeman Schwabe Four Post High Stroke die cutting press has the advantage of cutting multilayers of airbag material therefore increasing the production efficiency yields with increased manufacturing volumes and lower costs. Air bags are sewn from woven nylon fabric and are cut in different shapes and sizes depending on specific vehicle requirements. Talcum powder or corn starch is also used to coat the air bag; either substance prevents the fabric from sticking together and makes it easier to assemble.